PROPERTY The front door opens into the Hall, which has stairs leading to the First Floor and doors opening to the Kitchen and WC. The stylish, modern Kitchen which has a range of integrated appliances, is open plan to the generous Living Room with double doors to the rear garden, offering plenty of space to relax with family and friends. 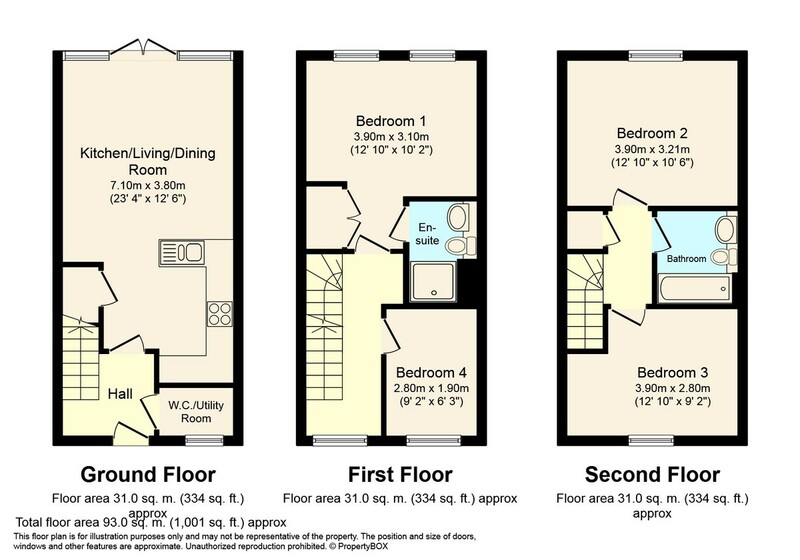 To the First Floor are two of the spacious Bedrooms, with one being the large Master suite, which boasts built-in wardrobes and an attractive En Suite Shower Room. To the Second Floor are a further two double Bedrooms and the Family Bathroom. OUTSIDE The rear garden is mainly laid to lawn and enclosed with wood panel fencing and side access. A small patio is adjacent to the property access from the lounge. To the front is allocated parking.